After becoming an ARDMS registered Diagnostic Medical Sonographer in 2017, the effort to succeed does not end. It is time to arrange interviews with employers. Those offered positions make it through interviews by showcasing professionalism and preparedness. However, some sonographer job seekers ruin their interviews by not preparing to answer difficult questions or making a bad impression in other ways. Understanding how interviews can be ruined is the first step in avoiding common mistakes. The Bureau of Labor Statistics reports the employment growth rate for Diagnostic Medical Sonographers for the period 2012-2022 is projected to be 46 percent versus 10.8 percent for all occupations. The first mistake a job candidate makes is assuming that the high demand for sonographers makes the job candidate a shoe-in for one of the sonographer positions. That is not true, and approaching the interview with that belief could lead to a cockiness that will not go over well. Employers will continue interviewing people until they find the one they think will be a good fit for the medical facility, even if they are anxious to fill a position. Following are some common mistakes ultrasound technicians and others make that can cost them a job. These rules apply to sonographers fresh out of a CAAHEP accredited program who have no experience and to employed sonographers changing jobs. Giving too many “gory details” about a previous employer. The interviewer does not need to hear that the supervisor was a rude boor or that the facility operating procedures were horrendously inefficient. The potential employer only needs to know the job was not a good fit in some way. Avoid giving too much information, and put a positive spin on the situation by explaining what was learned from the experience. Presenting a list of personal requirements like ultrasound salary and benefits, work schedule, need for time off, etc. 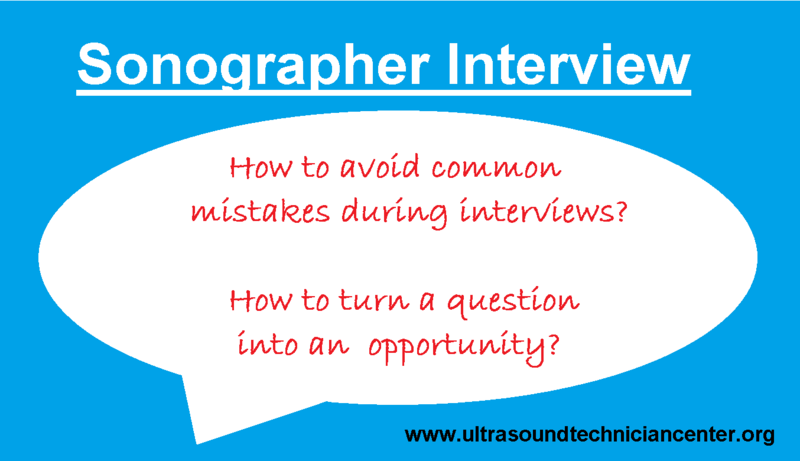 on the first interview until a job offer comes through, the sonographer should not discuss these issues, unless the employer insists. Once the job is made, it is a good time to discuss the factors involved in setting the ultrasound salary. Discussing other job offers, believing it shows desirability. This approach comes across as arrogant and sends a message that the candidate has not decided if he or she is really interested in the job. Not doing research on the employer – Most employers test the candidate’s real interest in the job by asking questions that inform as to whether the job candidate conducted research on the employer. The interviewer who says, “I didn’t know…,” too many times during the interview to questions like, “What do you think about the new outpatient clinics we just opened in the city outskirts?” is demonstrating lack of preparedness and thus interest in the position. Just reading the ultrasound job description is not enough. Keep goals reasonable – Telling an employer, “One day I am going to run this clinic,” does not leave a good impression. Neither does, “My true passion and ultimate goal is to get a high-paying job in the commercial ultrasound technology industry,” when the employer only operates nonprofit hospitals or clinics. It is very likely the employer will start thinking the candidate will be a short-lived employee just waiting for a better opportunity. The position can and should mesh with the desired career path, but only comment based on the information on the resume. These are just five examples of how a Diagnostic Medical Sonographer can ruin an interview and lose out on a job. There is a great likelihood that many of the people complaining on forums that they cannot find a job have committed some of these mistakes. It is a competitive job market in some areas, but that only means the ultrasound technician should be fully prepared to present him or herself in the very best light. Skilled interviewers will try to give the person being interviewed every opportunity to showcase their knowledge and skills. They also want to let people talk so they can get a solid impression of the person’s personality, communication skills and reactions when under pressure. This is one reason difficult and leading questions are asked about things like personal weaknesses or how the interviewee would solve a particular problem. There is no way to anticipate every question, but there are common mistakes made concerning the answers given. The first point to keep in mind is that answers should always present the interviewee in a good light, even if the question seems to encourage revealing personal information like weaknesses or bad habits. Maintaining a positive attitude and avoiding any indications of arrogance, negativity, disinterest, lack of enthusiasm for the position, etc. It does not matter if the candidate has applied for other jobs. The Diagnostic Medical Sonographer needs to consider each job opening as the one topping the list of desired positions. A skilled interviewer will quickly pick up on the fact the candidate is thinking, “This is not my first choice!” by reading attitude, expressions and body language, and by reading between the lines of the answers to questions. Take each interview seriously, and do not miss out on a position due to lack of preparation. Put the same effort into the interview that was put into learning how to become a sonographer. Just remember that it is easier to ruin an interview than to get it right. Are Ultrasound Technicians in High Demand? How to Earn a High Ultrasound Salary? See our 8 Steps to Becoming an Ultrasound Technician in 2018! How does an Ultrasound Machine Work? QUIZ: Am I Suitable to Work as a Sonographer?